*Single-Point® is a registered trademark of Wilderness Tactical Products, LLC and Giles Stock and may not be used without permission. The Single-Point Sling design is patented by Wilderness Tactical Products, LLC and Giles Stock and may not be copied without permission. 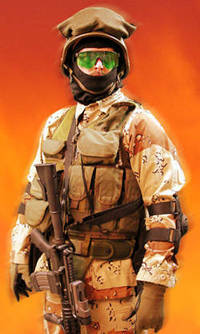 The original Wilderness Single-Point Sling is focused primarily on CQB and vehicle-mounted operations. It is simple and uncluttered, and allows full support-side shouldering and shooting for tactical cornering. It is suited to military, law enforcement and civilian use. Currently in use with elite U.S. Army, Navy, USMC and Air Force units, as well as top law enforcement SWAT teams, the Single-Point Sling has proven itself in hotspots around the globe and here at home. Using adapters that place attachment points at the rear of the receiver, you can mount the sling to M4-type carbines, full-stock AR-15/M16 rifles, Remington 870, Mossberg 590 and Benelli shotguns. The Single-Point Sling itself will also fit any other weapon-system with a 1-1/4" sling attachment point near the rear of the receiver. A large 1-1/4" side-release emergency release buckle is standard; it is stronger than 1" and easier to release under stress. The optional Giles Single-Point Quick-Detach (SPQD) adapter adds the ability to clip into or out of the weapon for vehicle transport or weapons-rack storage. A second SPQD added to the front sling swivel allows the Single-Point to immediately convert to a 2-point carry sling without removing it from the body. Rounding out the family of accessories is the new Single-Point WASP (Wilderness Adapter, Single-Point) designed to interface with the military MOLLE modular system on many vests and plate carriers. Simple and robust like our other products, the WASP stays attached to the PALS webbing bars on your vest. The Giles SPQD adapter on your weapon (available separately) clips into the WASP. This allows you to seamlessly transition between using a standard Single-Point Sling body for rear areas to the Single-Point WASP when donning your armor for hot zones. Our Single-Point accessories use only high-quality 1-1/4" (military standard size) webbing made specifically for The Wilderness to our specifications for rigidity, vertical cross-grain structure and durability, and color. Custom-made extra heavy-duty polymer buckles are used in critical areas. Available colors include standard black, Wilderness Coyote, or Wilderness O.D. Ambidextrous. Made by The Wilderness, with more than twenty years of experience making the finest, toughest tactical gear in the world – right here in America! We believe the Single-Point Sling works best on shorter weapons, however it has been shown to be functional on longer arms as well. It is most suited to MOUT/CQB-type operations, although the option of the 2-point conversion via a second SPQD makes the system a viable choice for field operations. (Above left) Close-up of Giles Stock demonstrating the quick-release buckle system. When actuated, the weapon falls free of the operator. (Left to right) Coyote, foliage, and black.